Rylee returns home from school to find her father with a knife in his chest on the kitchen floor, her terrified little brother and no sign of her mother. The word RUN has been written in blood on the kitchen floor. Whilst obviously shocked at this turn of events, Rylee knew that this day was coming as for as long as she can remember, her family have been on the run from a shadowy figure that stalks her mother. With only a few clues that her Mum left behind, Rylee has to get her brother to safety and delve into family secrets and old murder cases to try to find her Mum before it’s too late. 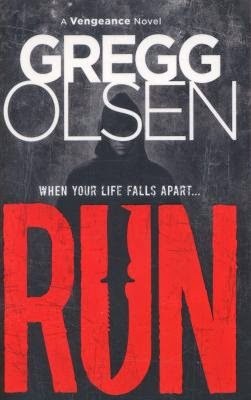 Gregg Olsen is best known for writing true crime books and this shows in the details of Run – frightened people do very strange things and the impact of horrific crimes often doesn’t fade away from the people affected. Run is the first book in a new series, the ending will leave you wondering if Rylee is making the right choices and hoping that the next book comes out soon.